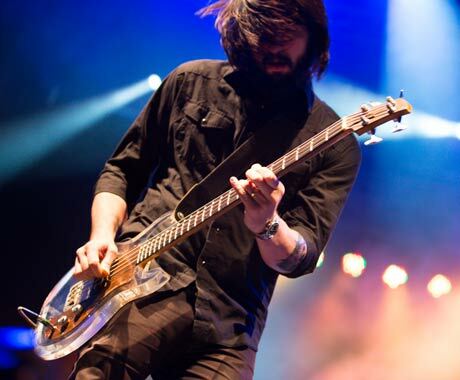 If the hype and sheer size of the crowd is any indication of an anticipated set, the defunct then reunited Death From Above 1979 were one of the most anticipated of the weekend. After disbanding in 2006 and reuniting two years ago, Jesse F. Keeler and Sebastien Grainger played a blasting set of nostalgic favourites, with a few new tracks thrown in. Grainger, as per usual, engaged the crowd in playful, sarcastic banter, moving between the main crowd with the extended mosh pit, and the side crowd in the booze-only area. The guys moved through a mass of old material, playing favourites like "Black History Month," "Turn It Out," and "Romantic Rights," and the songs are still as intense and impactful as they were when they first came out a decade ago. Crowd response was phenomenal, as mosh pits erupted and crowd surfers dominated the throngs of people. A couch cushion went bouncing over heads, and someone in a full horse costume got passed around across the crowd. Keeler closed the show by playing with one hand behind his head, and Grainger by tossing the snare onto his back and shoving the rest of his kit across the stage. It was a perfect ending.